The article notes that U.S. policymakers are taking notice of Portugal’s experience, especially in view of the spiking violence related to the drug trade in the U.S.-Mexico border region. If you are interested in news and analysis of the situation in Mexico, you may want to read this piece in the New York Times. The title of the article labels Dobbs a hypocrite, but that kind of name-calling seems distracting and beside the point. The larger and more important consideration that Dobbs’ situation highlights, to me, is how the attempt to brush this segment of our society out of the political picture with the label “illegal” is doomed, eventually, to failure, because it ignores reality: these so-called “illegal” immigrants are deeply integrated into U.S. communities and the U.S. economy, to our mutual benefit. 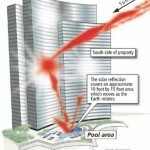 It turns out that what Pintas felt was, as a reporter on a video on the ABC site called it, “laser-like beams” created when the hotel windows focus the sunlight and reflect it into the hotel’s outdoor pool area. The ABC video includes footage of a plastic cup melted by the heat. 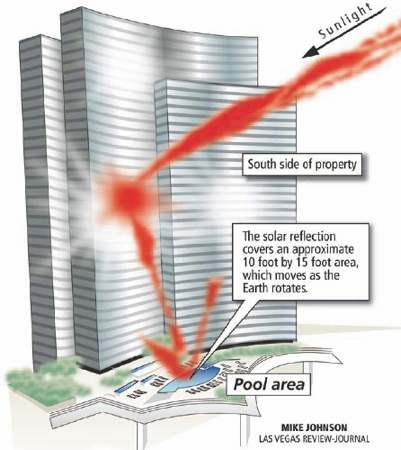 I am already dreaming of a legal writing problem focused on the potential legal claims that could arise from the unintended “death ray” effect created by this type of window…. Illegal aliens are a “mutual benefit?” Only to the very wealthy. The best analogy is to slavery in the pre-civil war South. Most history books who have you believe everyone in the South owned slaves. In fact it was only 5%-10%. Illegal aliens are the puppets and tools of the very rich. Put another way, Marquette Law School seems to be doing well without resorting to using illegal aliens. Applying the logic of this article, it would do a lot better if we had illegal aliens as professors. They could be paid 1/10th the amount of “legal” profs and perhaps then tuition could be reduced. Put even another way, if illegal aliens are so good for our society, why doesn’t the law school admit them? Why don’t we just let anybody practice law? Why should students bother with law school? Why do we even have laws at all if those who break them are so good for society?